For more than 25 years, EOSDIS Distributed Active Archive Centers (DAACs) have maintained the flexibility to serve ever-greater volumes of data to an ever-growing worldwide user community. When the Earth Observing System Data and Information System (EOSDIS) became operational as part of NASA’s Earth Observing System (EOS) in 1994, it faced a daunting challenge. Charged with providing end-to-end capabilities for managing NASA’s Earth science data from sources including satellites, aircraft, field measurements, and various other programs, EOSDIS had to accomplish this using 1990s technology - personal computers with an average of 400 to 1,000 megabyte (MB) hard drives, 33 MHz processors, and 14.4k “high speed” modems. A critical EOSDIS need was to establish a structure that would enable efficient scaling to deal with the surge of data from planned and future EOS missions along with inevitable advances in technology. NASA’s Earth Science Data and Information System (ESDIS) Project manages the DAACs. DAACs are collocated with centers of science discipline expertise, and archive and distribute standard data products produced primarily by Science Investigator-led Processing Systems (SIPS). NASA ESDIS Project Graphic. To facilitate the archiving and dissemination of NASA Earth science data and account for the growth of data in this collection, a model for establishing a network of discipline-specific Distributed Active Archive Centers (DAACs) was proposed as far back as 1986. This model was adopted by NASA for the EOS program, and the DAACs became part of EOSDIS in 1994. From an initial collection of eight DAACs, the EOSDIS DAAC system has grown to include 12 DAACs across the U.S. The EOSDIS enterprise architecture, developed in the 1990s, relies on distributed nodes (the DAACs) to most effectively and efficiently serve the science user community. These DAACs are managed by the Earth Science Data and Information System (ESDIS) Project, which is responsible for EOSDIS science systems. This design not only spreads the load across many systems, it also allows individual DAACs to customize services to meet the needs of the specific science disciplines they serve, which include atmosphere, calibrated radiance and solar radiance, cryosphere, human dimensions, land, and ocean. In addition, by adopting a system using many DAACs to archive and distribute data, NASA ensures that the system can easily scale to meet the growing production of science data and handle future missions that will generate greater quantities of data. Over the past few years, numerous DAACs have achieved milestones of service to the global network of EOSDIS data users. 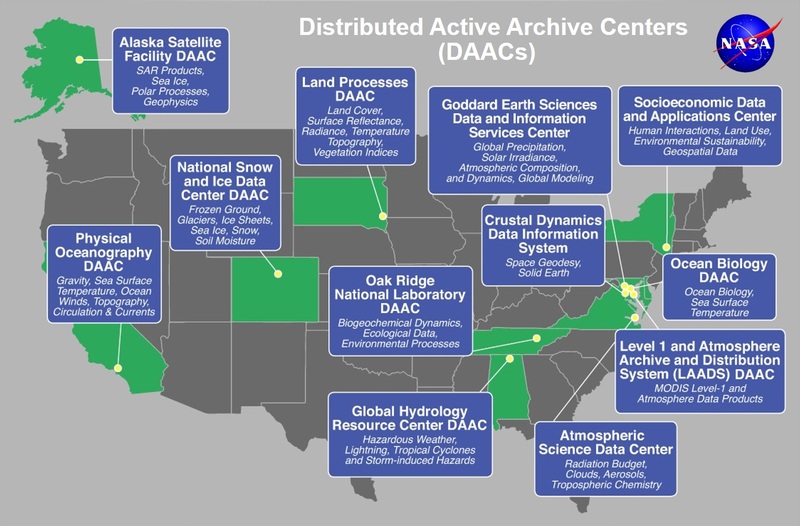 The summer of 2018 saw the 25th anniversary of the National Snow and Ice Data Center DAAC (NSIDC DAAC) as well as the 20th anniversary of the relocation of the Center for International Earth Science Information Network (which is the home of the Socioeconomic Data and Applications Center [SEDAC]) to Columbia University. the Land Processes DAAC (LP DAAC) observed its 25th anniversary in 2015, while the Alaska Satellite Facility DAAC (ASF DAAC) reached this milestone in 2016. The DAAC network and its partnership with academia, other federal agencies, and NASA has led to the development of a world-class science data system. EOSDIS DAACs are custodians of EOS mission data and serve a broad and growing user community with both EOS data and non-EOS data (such as data from the European Space Agency [ESA] Sentinel-1 satellites, which is processed by ESA and has been distributed by ASF DAAC since 2016). In addition, DAACs are leaders in data management and are at the forefront in developing new tools and technologies to manage and serve data, such as the Application for Extracting and Exploring Analysis Ready Samples (AppEEARS) subsetting application developed by LP DAAC, the Giovanni data visualization and analysis tool created by the Goddard Earth Sciences Data and Information Services Center (GES DISC), and SEDAC's Hazards Mapper. As EOSDIS metrics show, the amount of data archived and the number of EOSDIS products distributed have both grown significantly, especially with the return of the first data from the Terra Earth observing satellite (the first EOS mission) in 2000. From an archive volume of at most 500 terabytes (TB) at the end of Fiscal Year (FY) 2000, the EOSDIS archive volume has grown to more than 26.5 petabytes (PB), according to preliminary figures for August 2018 from the ESDIS Metrics System (EMS). Just as the EOSDIS archive volume has grown, so too has the number of EOSDIS data products distributed worldwide - from 5.52 million products in FY 2000 to almost 1.62 billion products as of August 31 for FY 2018 (the NASA fiscal year runs from October 1 through September 30). Comparison of EOSDIS archived data volume (left) with distribution of EOSDIS data products (right) from FY 2000 to August 31, 2018. The significant increase in the volume of archived data starting in FY 2015 is due to the addition of products from the Aquarius, IceBridge, GPM, and ALOS PALSAR missions. The significant increase in data products distributed in FY 2015 and FY 2016 and the slight decrease seen in FY 2017 are due to two factors: 1) Terra and Aqua MODIS data were reprocessed in FY 2016 and both MODIS Collection 5 and Collection 6 data were distributed; MODIS Collection 5 products were no longer distributed starting in FY 2017, and 2) File Transfer Protocol (FTP) downloads were discontinued by various DAACs, which contributed to lower data product distribution in FY 2017. NASA EOSDIS graphics and metrics. Acting in concert, EOSDIS DAACs provide reliable, robust services to users whose needs may cross the traditional boundaries of specific science disciplines, while continuing to support the particular needs of users within their discipline communities. All DAACs maintain User Services groups that are the primary points of contact for data users. Ongoing user feedback and DAAC outreach are critical to ensuring that EOSDIS data users have the specific data, tools, and services they need and that these data, tools, and services are available and working properly. In addition, DAACs provide a wealth of information - including tutorials, webinars, and data recipes - to show users how to work with specific data sets, manipulate and subset data, and share information. Since DAACs are discipline-specific, they need to remain intimately connected with the science communities they serve. This is facilitated through individual DAAC User Working Groups (UWGs). UWG members are subject-matter experts who provide guidance and direction for the DAAC they serve. During calendar year 2017, 23 DAAC UWG meetings took place involving more than 260 DAAC, UWG, and ESDIS Project representatives. Providing research and development advice for product prototyping and generation. Along with input from UWGs, the quality of DAAC products and services is evaluated annually through a formal survey of EOSDIS data users. These surveys have been conducted since 2004 and ask users to rate the services and products of the specific DAAC or DAACs from which they acquire data. The results of the 2017 survey indicate that all DAACs are providing high levels of customer service and high-quality data products, results that are consistent with all previous years. The 2018 survey is being conducted in September and October, with survey invitations sent worldwide to DAAC data users with a valid Earthdata Login email address. A key component of the survey is the opportunity for survey respondents to provide comments about the specific DAAC or DAACs they are rating, including comments about specific data products and services. These comments provide yet another opportunity for the DAACs to verify that they are developing the right data products in the appropriate formats to meet the needs of their user communities. For more than a quarter-century, the DAACs have remained foundational components of EOSDIS and play key roles in ensuring that the data in the EOSDIS collection are available fully and openly to data users. Their cutting-edge work in developing new tools and techniques for archiving, serving, and managing big data collections helps enable the flexibility necessary for EOSDIS to easily scale as the volume of its data collection, along with the global users of this collection, continues to increase.